Up to 218w, and tc mode is easy. I have no complaints. Love this mod, working great and nice display. Got this OBS bat kit to go with my Crius RDA. Perfect match! Love the flavor and huge clouds. And the price is good. Would recommend this store. The bat mod is everything I wanted. Reliable performance, good looking, great price. One thing, you'd better charge your battery cell by external charger. It's safer. OBS bat tc mod works perfectly. Prices here are much cheaper than local store. Worth the waiting and bucks. I will buy stuff here again. 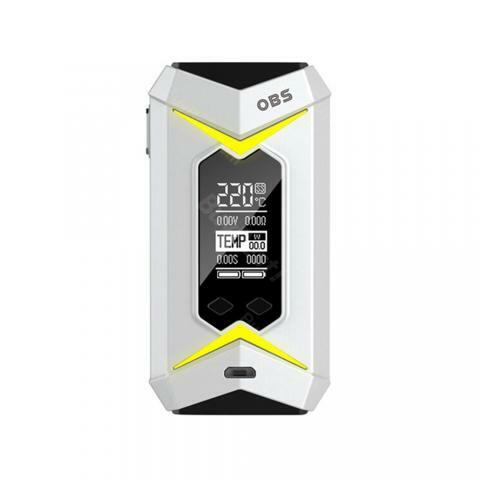 As the first box mod from OBS, the Bat mod not only stands out in outlook design but also performs well in every respect. It runs on dual 18650 batteries that supports a max output power of 218 watts. The big fire button gives you a nice responsive touch and the two LED lines on the front panel highlight this device with 7 brilliant colors. The OBS Bat also features a big crystal screen that allow you to check all vape data easily. The Bat comes with power mod and TC mod as well as soft and hard mod. It can match with most tanks in the market for a fantastic vaping experience. • No 18650 cells included. You need to buy it separately.